Ron was in town yesterday, so we went out up in R County. I chose that area as it would put him on his route to his evening destination. Was fun meeting and fishing with Ron. Water in the middle sections of streams still had a good stain and vis was sufficient. Water in the upper sections was gin clear. 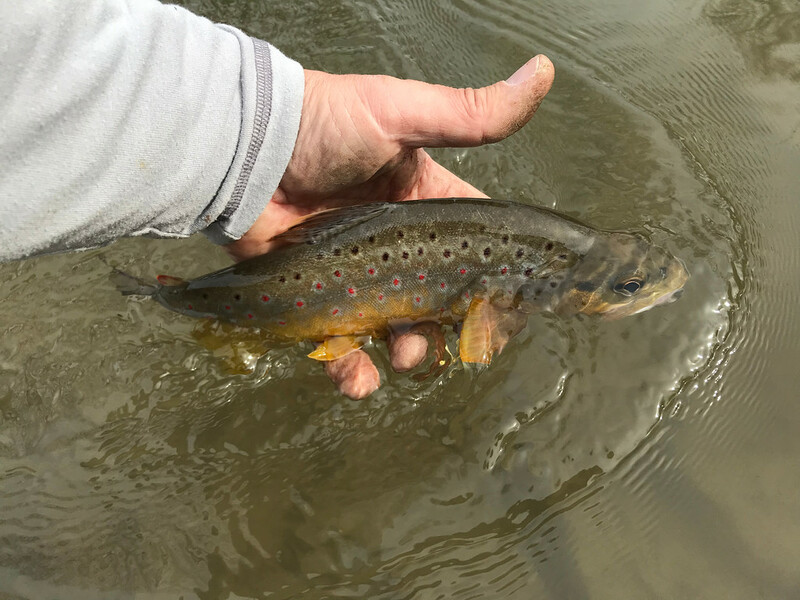 Fishing was sporadic and slow – a common theme so far this year for me. Haven't run into eager or hungry fish much and good-sized fish have often been hard to find. Lots of high pressure (high sky) days and wind too. 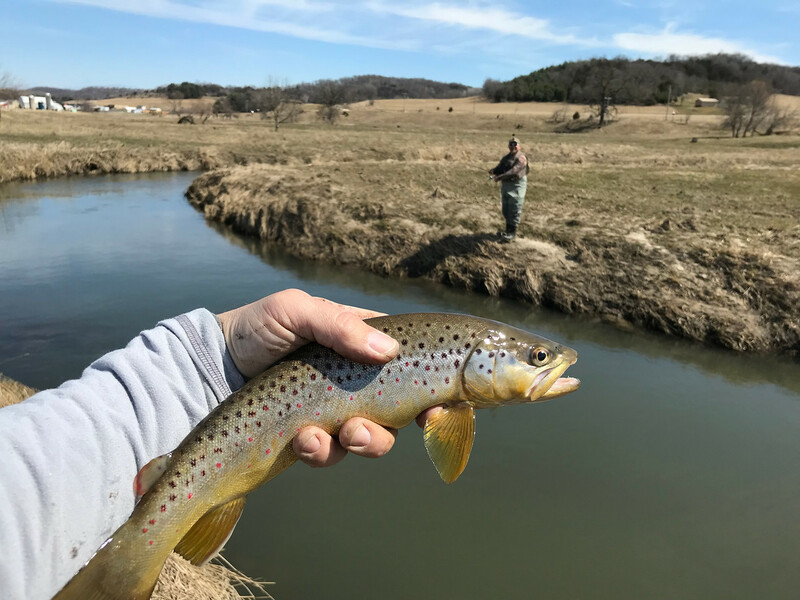 Still waiting for quality spring fishing to kick in. 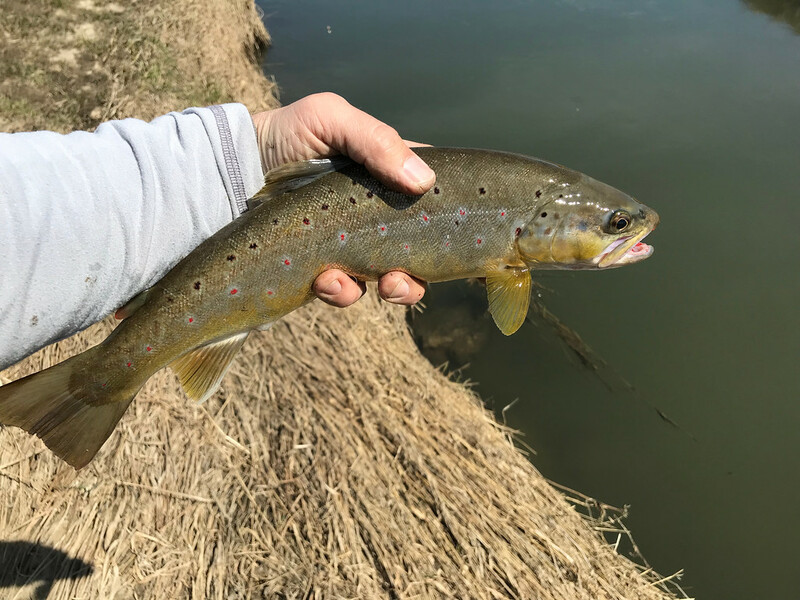 Quite a bit of short striking yesterday that was further evidenced by a few fish that were (foul) hooked under their jaw. Lots of fish chased or just darted out for a look. 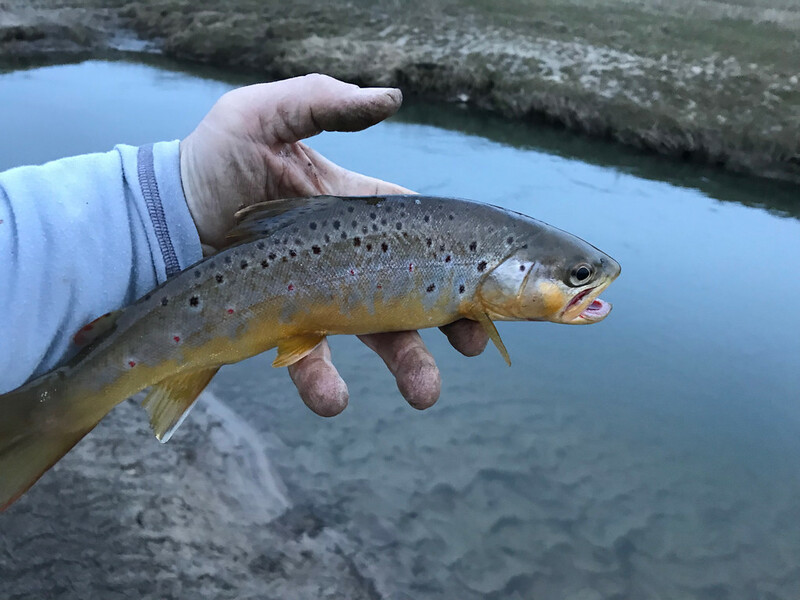 A late day/early evening rally of over 25 fish got me to around 40 fish on the day, but none of them were big. Fished from around 8am to almost 8pm. 40 fish may sound like a lot, but that's around 3 fish per hour and the largest (for me) was around 16 inches. Maybe we should have tailed Shebs to his spot. With the impending April Snowmagheddon for some of our members, would it be poor form to complain about the sustained high winds that made fishing tonight difficult? The steady 25mph gale dropped the wind chill into the 60s. Yeah, then it actually rained for a moment! The forecast for where I'm fishing is down to 7.2" total, with 7" landing tomorrow. Saturday should be fishable. Hey Im a new member here. first post. Just hoping to get an update on fishing conditions for saturday. Driving from northern wisconsin and have to make up my mind by 2pm today. Thanks! Call the shop closest to where you're planning on fishing. SE Minnesota could be dicey depending on how fast everything melts (but, the high for Saturday is only 39, which should help). I was planning to float Saturday but if the big water's blown on friday we're going to scratch that so we have more flexibility to jump spots. Might be a bit sketchy this weekend in SW Wisconsin. There were a few heavier rain showers that moved through the area in the last 24 hours, and some snow. May muddy things up in the larger streams and rivers but the smaller streams should clear quickly. It will be cold. Next week and beyond looks to warm up to more normal temps. Everyone's waiting for the first big bug hatches of the season. Not quite there yet. 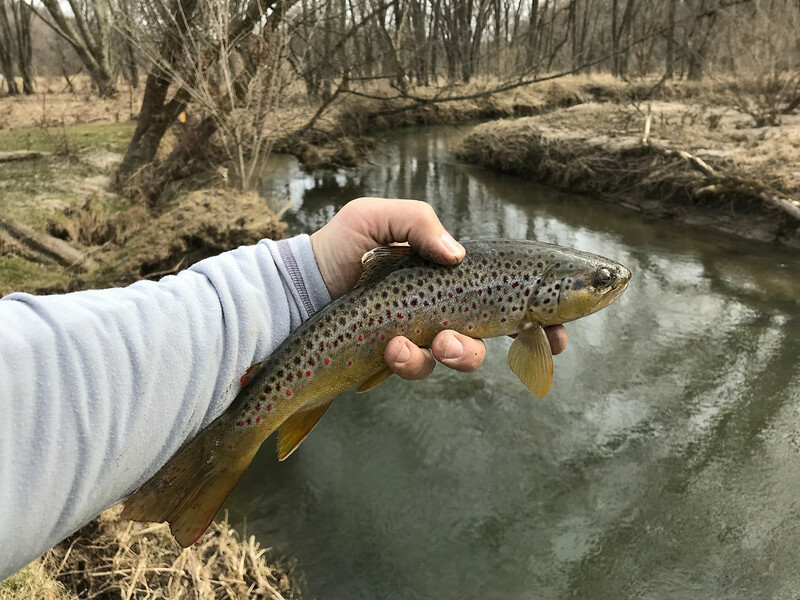 Wasn't expecting to get out yesterday but an obligation went away and I was able to jump on a stretch of a favorite big fish stream that I'd never hit before. Asked and received permission. Water was at normal flow with a nice stain. All I can really hope for when I go out on this type of water is a shot at something big. 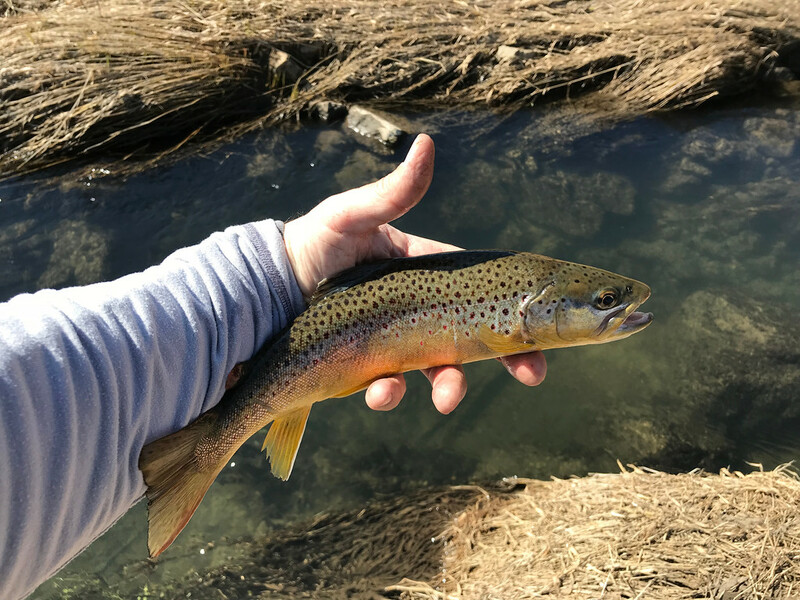 Had sporadic action and landed 7 browns – all solid fish in the 14-16 inch range that fought well and did their aerial thing. Lost around the same number as the bite was tentative at best. Would feel this tick… tick… nibble-bite and then have to set the hook. Lost the 7 when they were able to wriggle free. None of those 7 lost were huge, so no heartbreaks. Isn't it funny how an entire stream of trout can get into a group behavior? Think about that – it's like many parts of one being. Couldn't just half of them be aggressively hungry? 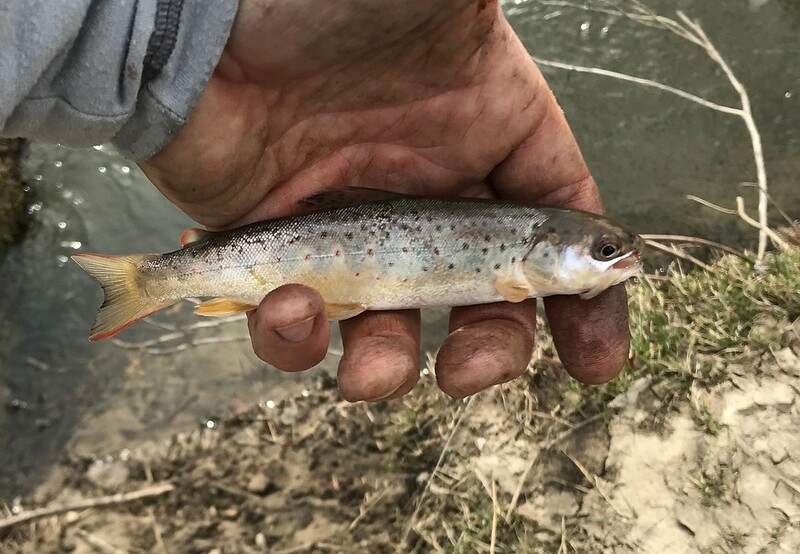 Was nearing the end and said out loud, "C'mon… just one big fish…"
And then it hit and I wasn't ready and the rod handle twisted in my hand and that's all he needed. Had him on for maybe 5 seconds and moving him in my direction and then he was off and slowly disappeared back to the depths. Gone… like a fart in the wind. "I'll either catch (a big) fish today, or I'll learn something." Be ready dumbass! Especially when you're saying out loud that you want a big fish. So… I've lost the last two 18-20s (Sunday) that I've had on.